This past spring, I bought a floribunda rose named 'Summer Romance'. A $15 rose for $3. It was 1½-2 feet tall. Since that time, it has grown to over 6 feet. It has not bloomed. Although not the right time, I pruned it drastically in hopes of shocking it into bloom at least once before winter. The canes I cut from the bush were quite long. 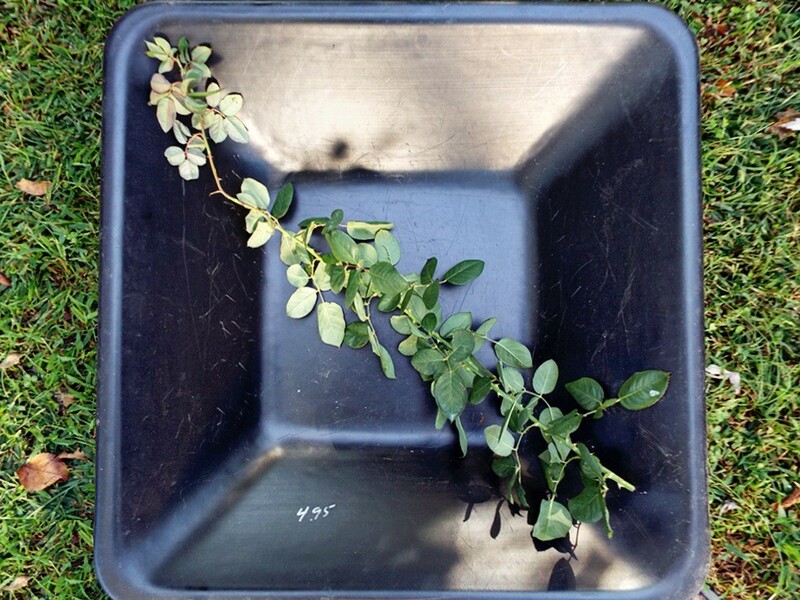 Strictly for my own use, I decided to see how many cuttings I could get from the 5-6 canes I removed from the bush. Here's how I did it. 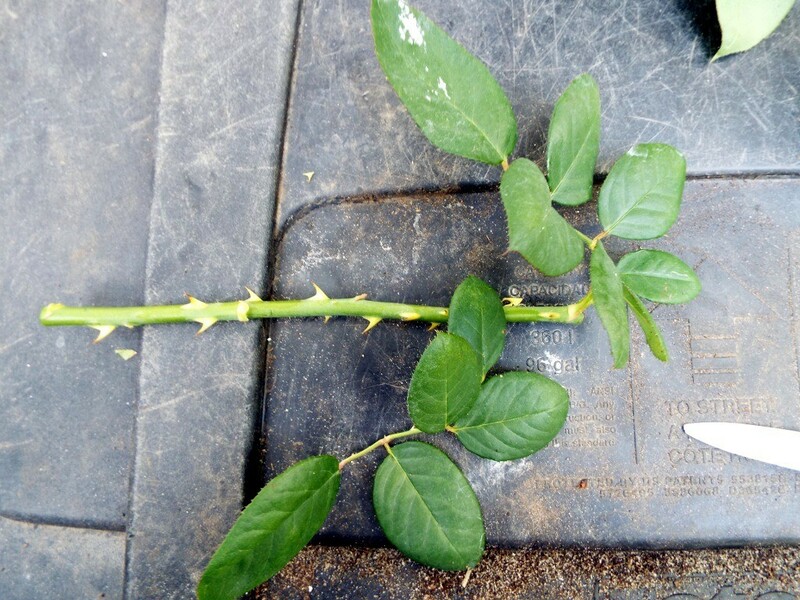 I cut the canes from the bush immediately above a leaf node. 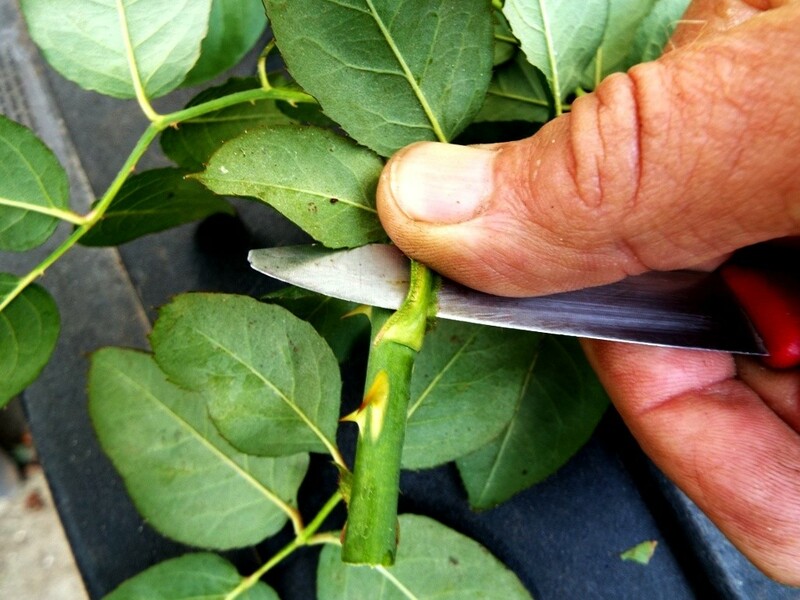 Next, using a clean, sharp knife, I cut the severed cane just below a leaf node. 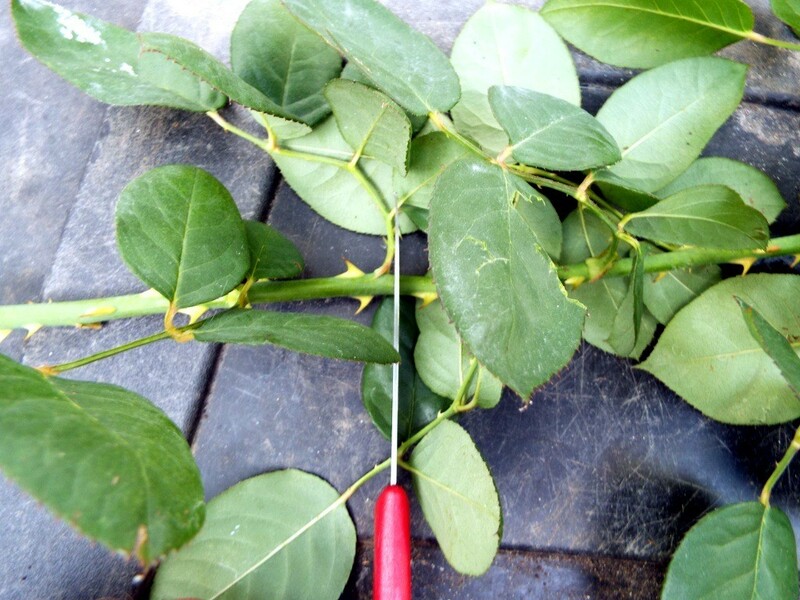 Next, I removed most of the leaves from a 6 inch portion of the cane by putting my knife under the leaf stem, close to where it meets the cane. Using my thumb to hold the leaf against the knife blade, I twist the blade upward, snapping the leaf stem from the cane. I leave 2 leaf stems at the upper end of this 6 inch piece. Immediately above the upper leaf stem, I sever the piece from the rest of the cane. 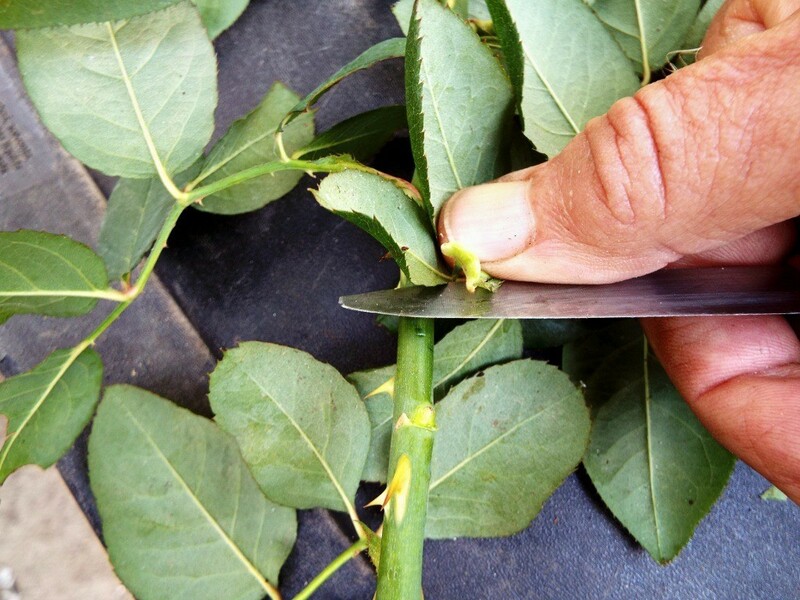 Next, I trim away most of the remaining leaves, leaving only 2-3 per stem. I continue this method the rest of the way up the cane til I get to the very tender tip. It is not likely to root. My 5-6 canes have yielded me 16-17 cuttings. 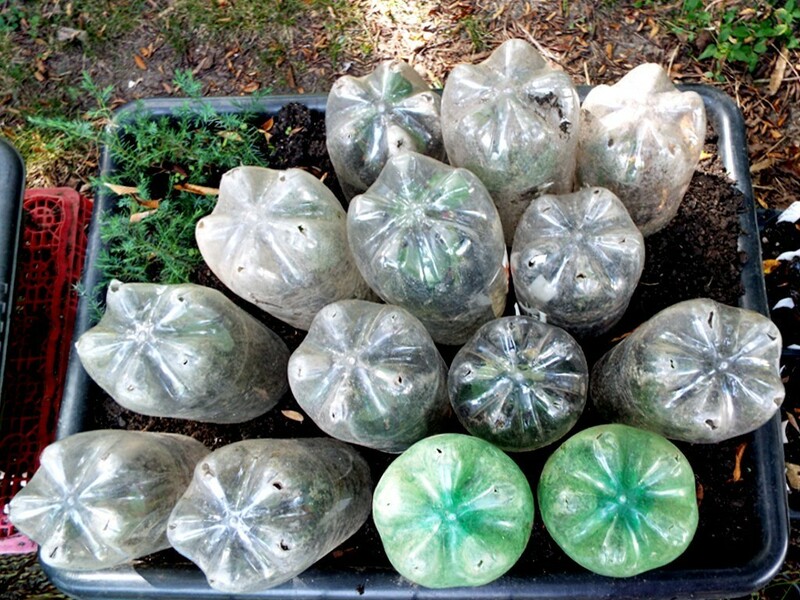 Usually, I would bundle the whole lot with wire and plunge the bundle into the soil. This time, I'm doing it differently. 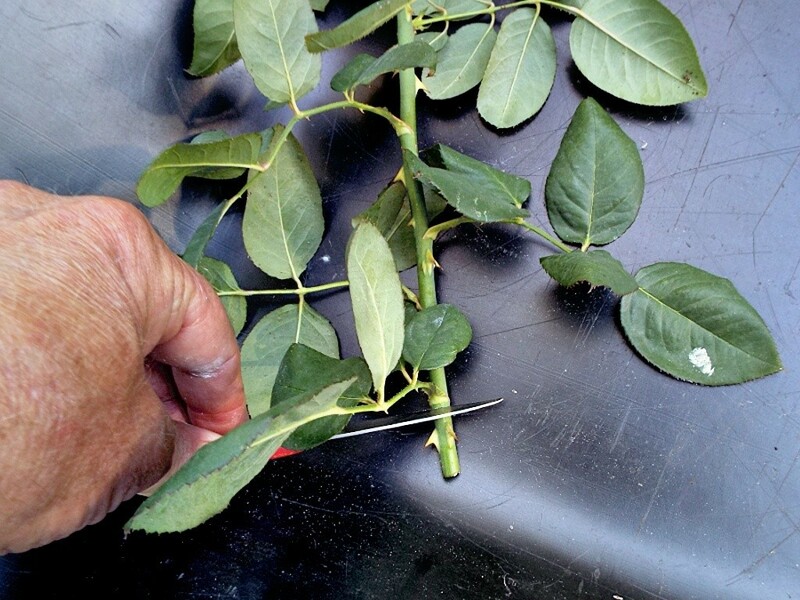 June and July are the best months for rooting most cuttings, including roses. 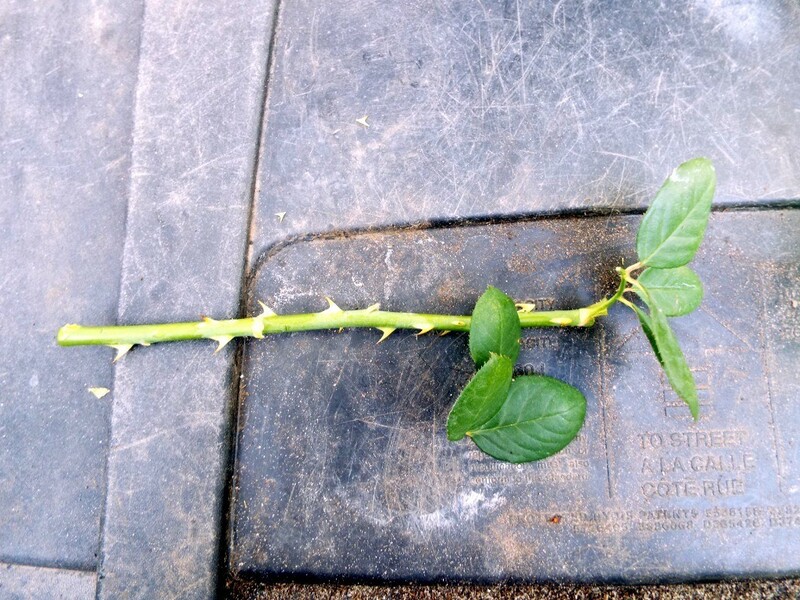 Cuttings taken in September can root quite well, though the success rate probably won't be as high. 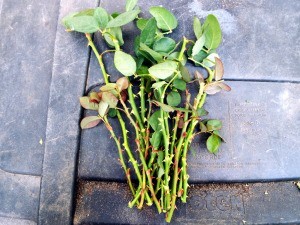 The risk of losing the cuttings to damping off is greater at this time of year. For that reason, I am rooting them individually. If one damps off, it will not have a chance to infect others. Just before the expected first frost, I will lift these cuttings. Those that have rooted will be put into individual pots. The pots will be sunk into the ground and heavily mulched to help protect the tender root systems. Hopefully, come spring, I will have at least a dozen more rose plants to go into a garden set aside just for them. If you are wondering why I would want so many cuttings of this rose, this link says it all ( plus, I don't yet have a picture of my own to show you). Wow! That's a beautifully shaped rose. Pretty!! Not only that, it is highly disease resistant and has a heavy fragrance. Beautiful rose! I hope you have great success.